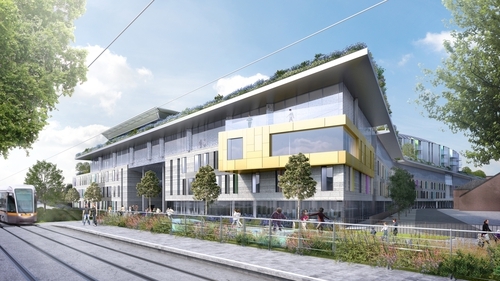 Cost overruns at the National Children's Hospital could require the Department of Transport, Tourism and Sport to find savings of €30 million in its capital budget this year, RTÉ News understands. The Government announced last year it would spend an extra €286m on roads and other transport infrastructure this year. The savings are part of the €100m needed this year to deal with the spiralling costs at the hospital which is set to cost around €450m more than was originally budgeted for. It has emerged that a payment of €27 million earmarked for the Dublin to Derry road upgrade jointly funded by the Irish and British Governments will be delayed due to cost overruns at the Hospital. Sources have indicated that the construction of the A5 road has been the subject of court challenges and work is unlikely to begin on the route until the later part of this year at the earliest. If that happens money would still be made available by the Irish Government but the funds would not be transferred until next year. Mr Donohoe's memo will propose savings across eight Government departments. The memo will be brought directly to Government and much of its politically sensitive contents will not be known in advance of the meeting, according to senior sources. However, intense discussions are still under way as the revised spending proposals are being finalised today. Around €50m is going to come from the Department of Health's capital budget which is likely to delay the upgrading of some hospitals. As well as the Department of Transport, it is understood that six other departments have been asked to find savings in the region €3m each. Taoiseach Leo Varadkar said last week that the changes will be manageable.